Lucas County Parcels are 3339467 (19.80 acres) & 3339697 (37.04 acres. 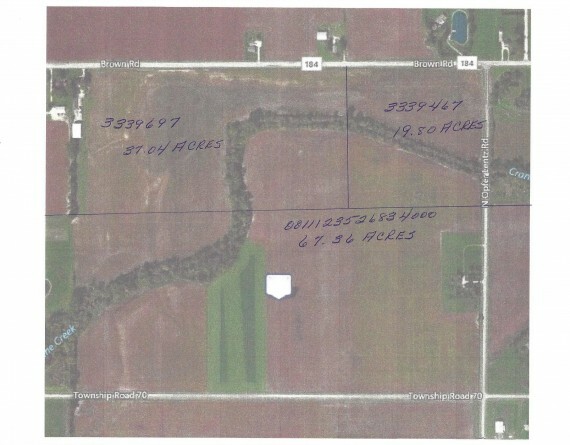 Ottawa County Parcel is 0011123526834000 (67.36 acres). Farmer has all rights to 2017 crops. Approx. 2.36 acres of parcel 0011123526834000 will stay with the home on that property. 5% down by cash or check which will become your non refundable deposit. The real estate is sold As Is with no contingencies. All inspections must be done prior to Auction. Close within 30 days. Buyer and seller to pay their parts for closing costs. General warranty deed given at closing with no liens or back taxes.